Sports Enthusiasts’ 2015 College Football Preview is up to part four and the Mountain West Conference’s West Division. The MWC’s Mountain Preview can be found here while the entire schedule for each conference or division preview is below. Below is a look at the Mountain West Conference’s West Division and conference championship prediction. San Diego State will be in their 5th year under head coach Rocky Long and he has been ultra consistent making a bowl game in each of his first four seasons. Year 5 will have added pressure as they will be one of the favorites to make the Mountain West Championship Game. The offense will be led by Donnel Pumphrey at the running back position. All he did was run for 1,867 yards and 20 touchdowns in 2014 with a 6.8 yards per carry average. Even his backup, Chase Price, ran for 674 yards and 5 touchdowns. Those two will be important as the Aztecs are breaking in a new quarterback in Maxwell Smith, who has transferred in from Kentucky. He should be able to be on par with last year’s starter Quinn Kaehler. Kaehler threw for 2,157 yards with 9 touchdowns, 12 interceptions, and 55% completions. Smith will also have two of the top three receivers from 2014 as well as 3 starters from the offensive line returning. The offense should be just fine in 2015. The strength of the San Diego State team in 2014 was the defense. They gave up only 19.8 points and 332 yards per game while bringing back only 4 starters. In 2015, the number of returning starters is eight including six of the top 7 tacklers. The losses are all in the front seven with one on the defensive line and two at linebacker. 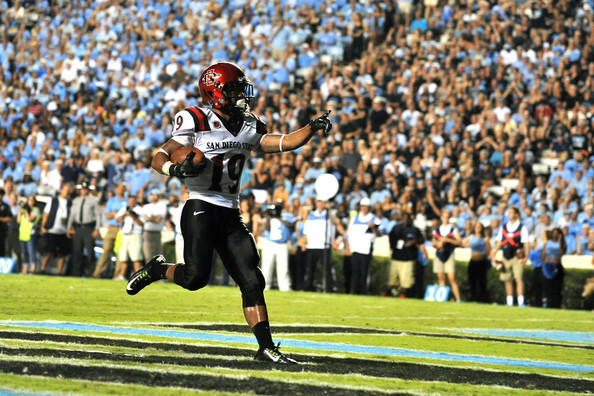 The secondary will be the focal point for the Aztecs defensively. They gave up only 179 passing yards per game and allowed only 55.8% on completions. All four starters return, which means opposing quarterbacks better watch out. San Diego State opens the season against fellow city university San Diego before an in-state road trip to California and another home game against South Alabama. The wrap up their non-conference schedule at Penn State before another home game against Fresno State. The Aztecs have a fairly easy Mountain West schedule by not having to face Air Force or Boise State and get Utah State at home as well. Things are looking very good for San Diego State in 2015. It is probably a bit surprising to see San José State here in the second spot of the West Division after a 3-9 season in 2014, but there are plenty of positives including 16 starters returning. On offense, the Spartans return 10 starters with their lone loss at the center position. Joe Gray returns at quarterback after throwing for 2,305 yards with 11 touchdowns and 9 interceptions. His most impressive stat from 2014 is the fact he completed 63.6% of his passes. He will also have his top three receivers from 2014 back including Tyler Winston. Winston caught 78 passes for 694 yards and 5 touchdowns. Newcomer Kanya Bell is a prized recruit who is likely to see a big role in 2015. Tyler Ervin will be the starter at running back after 888 yards and 4 touchdowns with four of his offensive linemen back to pave the way. After averaging only 19.3 points and 395 yards per game in 2014, the offense should do far better this year. San José State has 6 starters returning on defense including linebacker Christian Tago, who tied for the team lead in tackles with 96. He also recorded 5.5 tackles for loss. Both the defensive line and linebacking units lose two starters, but considering the fact they gave up an average of 259 rushing yards per game in 2014, it may not be the worst thing. The secondary only allowed 118 yards passing per game in 2014 and they return three starters as well as adding in a solid freshman (Tae’on Mason). The defense should be solid again in 2015. San José State has a tough start to the season after an opening game against New Hampshire. They have back-to-back road games against Air Force and Oregon State before a home game against Fresno State. They draw New Mexico and Boise State from the Mountain Division in addition to Air Force. San José State could surprise many and they are right in the thick of the race for second in Mountain West Conference’s West Division. Fresno State has made the first two Mountain West Championship Games in 2013 and 2014, winning the first and losing the second. However, 2014 was a sub-standard season with a 6-8 record including losses in the MWC Title Game and bowl game. In 2015, the offense will have some work to do with the top quarterback and wide receiver departing. Marteze Waller will have a heavier burden, but that should not be too much of an issue. Waller ran for 1,368 yards and 11 touchdowns in 2014. The quarterback battle will be down to freshman Chason Virgil and sophomore Zack Greenlee. Greenlee started against Wyoming, but had a very poor outing going 7 of 16 for 55 yards. Gone at wide receiver is Josh Harper (90 catches, 1,097 yards, and 7 touchdowns) while Aaron Peck will step in to fill his shoes. Peck caught 32 passes for 419 yards and 3 touchdowns in 2014. There will be some growing pains for Fresno State on offense, but should be able to reach their 2014 numbers of 28.5 points and 406 yards per game. The defense will have 5 starters back in 2015 from a defense that gave up 32.4 points and 456 yards per game a year ago. The defensive line has only 1 starter back in Todd Hunt, who recorded 54 tackles, 2.5 sacks, and 2.5 tackles for loss. There are two starters back at linebacker and in the secondary. The pass defense was poor in 2014 with 254 yards passing a game given up as well as 60.4% on completions. Like offense, there will be some growing pains. Fresno State has an easy game against Abilene Christian to start the season before back-to-back toughies at Ole Miss and home to Utah. In conference, they have early road tests against San José State and San Diego State in back-to-back games before a home game against Utah State. They draw Air Force and Colorado State out of the Mountain Division as well. Fresno State could finish as high as second or as low as fourth in this division, but should be able to reach bowl eligibility. Nevada enters 2015 with Brian Polian in his third season at the helm. Polian led Nevada to a 4-8 record in 2013 before a 7-6 record and a bowl game in 2014. 2015 will bring back six starters on offense for the Wolf Pack, but one of them is not at quarterback. Cody Fajardo is gone after throwing for 2,498 yards, 18 touchdowns, and 11 interceptions as well as running for 1,046 yards and 13 touchdowns. Replacing Fajardo will be redshirt freshman Hunter Fralick. He will have four of the top five receivers as well as the second and third leading rushers from 2014. Don Jackson ran for 957 yards and 7 touchdowns while James Butler contributed 635 yards rushing and 5 touchdowns. There are only two starters returning on offense and the losses give some worry about their performance, at least in the early part of the season. On defense, there will be 5 starters returning from a unit that allowed 27.2 points and 447 yards per game in 2014. That unit also had 10 starters returning. Both the defensive line and secondary were hit hard by losses with two losses on the line and three in the secondary. The linebacker unit will be the strength with the #2 and #3 tacklers from 2014 comprising this group. Those two are Jordan Dobrich, who started only 6 games in 2014, but still managed to record 85 tackles. The other is Matthew Lyons who finished with 80 tackles. This defense will probably take a step back in 2015. Nevada will open the season with back-to-back home games against UC Davis and Arizona before road trips to Texas A&M and Buffalo. In conference play, Nevada draws New Mexico (home), Wyoming (road), and Utah State (road) from the Mountain Division, but have a brutal four game stretch to finish the season. Those four games are Fresno State (road), San José State (home), Utah State (road), and San Diego State (road). Nevada could finish second or third if they do well in the final stretch and should also make a bowl game in 2015. Hawaii has hit hard times after their spectacular 12-1 season in 2007. Norm Chow has gone 3-9, 1-11, and 4-9 in his first three seasons and another losing record in 2015 could see the end of his time in Honolulu. 2015 should produce Hawaii’s best offense under Chow. They return 8 starters from 2014 including their quarterback, but he is likely to be usurped by new arrival Max Wittek, who was previously at USC. Also returning is the top rusher from a year ago in Steven Lakalaka, though he only ran for 646 yards and 2 touchdowns. Wittek will have he top two receivers from 2014 as well with Marcus Kemp (56 catches for 797 yards and 3 touchdowns) and Quinton Pedroza (59 catches for 674 yards and 3 touchdowns). The highest production under Chow was in 2013 when Hawaii put up 27.4 points and 416 yards per game. 2015 should produce those numbers again, if not higher. On defense, the Warriors will have 6 starters back including their #2, #3, and #4 leading tacklers from 2014. Two starters have to be replaced on the defensive line and at linebacker. Kennedy Tulimasealii will anchor the line after recording 40 tackles, 2.5 sacks, and 7 tackles for loss. Simon Poti will be one of the top men at linebacker after putting up 64 tackles, 2 sacks, and 1 tackle for loss. The secondary will return three starters and a former starter in Marrell Jackson at safety, who started 15 games in his first two seasons. The defense should put up similar numbers as it did in 2014 (26.8 points and 418 yards per game). Hawaii does not have an easy non-conference schedule. They open with a home game against Colorado, travel to face Ohio State, come back home to face FCS UC Davis, and then travel to Wisconsin to close out September. Hawaii will also face Louisiana-Monroe on the final weekend in November to end the regular season. In conference, the Warriors draw Boise State (road), New Mexico (road), and Air Force (home) out of the Mountain Division. They do get San Diego State, Fresno State, and San José State at home, but it looks like another losing season for Hawaii. Bobby Hauck was given 5 years to turnaround UNLV and it looked like he would after a 7-6 season in 2013. However, the 2014 season produced a 2-11 record with both the offense and defense getting worse. Now, former high school head coach Tony Sanchez is the head coach and he has his work cut out. The offense returns five starters from a unit that produced 21.9 points and 387 yards per game. They will be learning a new system, but do return quarterback Blake Decker. Decker threw for 2,886 yards, 15 touchdowns, and 18 interceptions while completing 57.6% of his passes. He also ran for 365 yards and 5 touchdowns as the third leading rusher in 2014. The running game was by committee and the leading rusher from last year is gone while the #2 rusher, Keith Whitely, is back after running for 504 yards and 2 touchdowns. The top receiver in Devonte Boyd is back as well after he put up 65 catches for 980 yards and 4 touchdowns. Things are not looking too bad for UNLV, but 2015 might be a learning experience with the new offense being put in place. The defense also returns five starters as well as five of their top six tacklers from 2014. The defensive line was decimated by departures with only one starter returning, but that group gave up an average of 294 yards rushing per game last year. All three linebackers return including 2014’s leading tackler Tau Lotulelei. He had 99 tackles, 3 sacks, and 7.5 tackles for loss. The secondary was also hit hard with three starters lost. The lone returning starter is Peni Vea who had 88 tackles, 3.5 sacks, 4 tackles for loss, and 1 interceptions last year. The defense could be in for a long season with the losses they have sustained. The non-conference schedule will be tough for a new head coach. The Rebels open with a road trip to Northern Illinois, a home game against UCLA, another road trip to the Big House to face Michigan, and finish September with a home game against FCS Idaho State. The Rebels will be lucky to get a win from Mountain West play and could finish with double digit losses for the fifth time in six seasons. The 2015 Mountain West Conference’s West Division looks to be pointing to San Diego State as the winner. However, if they stumble or have a lot of bad luck, then it will be between San José State, Fresno State, and Nevada to win. Hawaii is a cut below the top four while UNLV will be back in the basement for 2015. Below is predicted order of finish for the West Division. Part three of the 2015 College Football Preview looked at the Mountain West Conference’s Mountain Division and took Boise State to win. With San Diego State predicted as the West Division winner, that means it will be between Boise State and San Diego State for the conference championship. Boise State looks like the superior team and they are predicted to win the 2015 Mountain West Conference Championship Game. Check back on Tuesday, July 14 for an in-depth look at Conference USA’s East Division Preview.